Philosophy in India is not a product of speculation but of experience direct and personal. A true philosopher is he whose life and behavior bear testimony to the truths he preaches. Every system of philosophy in India is a quest for truth which is one and the same always and everywhere. The modes of approach differ logic varies but the purpose remains the same trying to reach that truth all philosophical systems in India have a sort of family resemblance in that all Indian philosophical systems are spiritual in nature and therein lies their basic unity. Philosophical discussions are considered worthwhile to the extent they evoke an urge in us to reach that goal. The basic unity of the different systems of Indian philosophy was discussed at a seminar held at the institute on 3 February 1990. The seminar was attended by over one hundred distinguished scholars form different universities. The papers read at this seminar are reproduced in this book. 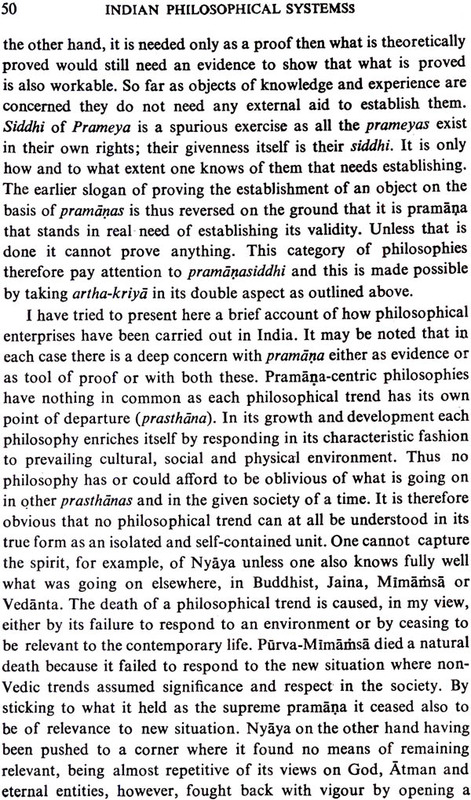 Philosophy in India is not a product of speculation but of experience, direct and personal. A true philosopher is he whose life and behavior bear testimony to the truths he preaches. Every system of philosophy in India is a quest for Truth, which is one and the same, always and everywhere. The modes of approach differ, logic varies, but the purpose remains the same—trying to reach that Truth. The basic unity of the different systems of philosophy was underlined at the seminar on the subject held at the Institute on 3 February 1990. Distinguished scholars of philosophy read papers at the seminar which was held with financial support from the Pritilata Kanjilal En-dowment created at this Institute by her niece, Mrs Leena Mukherjee. We hope the papers incorporated in this book will provide food for thought to all interested in Indian philosophy. The Himalayan International Institute of Yoga Science and Philosophy of the U.S.A.